Looking for a great way to perk up your wall art? 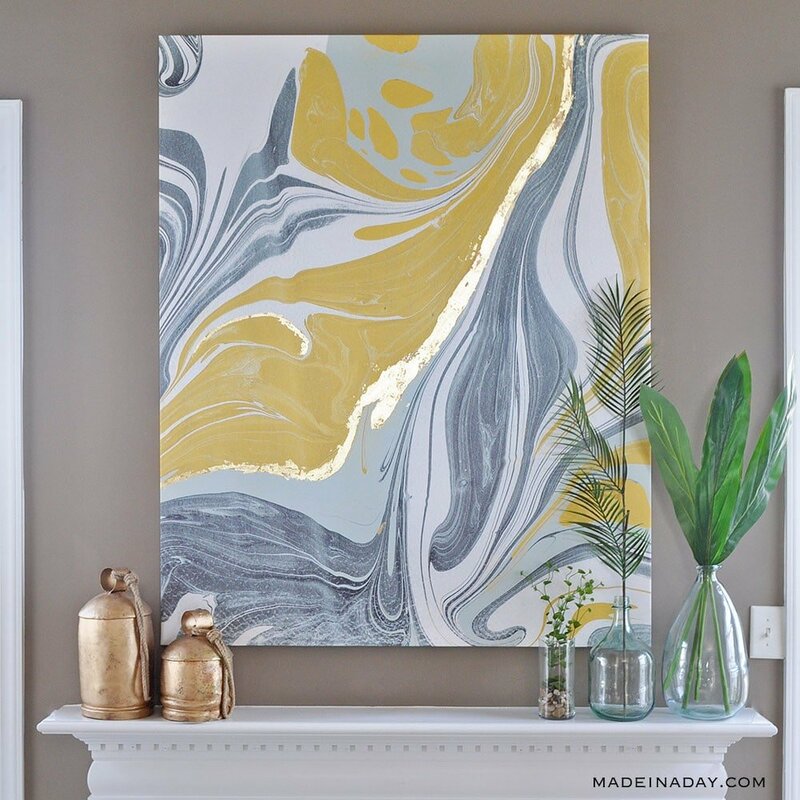 Try my Gold Gilded Marble Canvas tutorial to add extra bling to a modern abstract marbling printed canvas. Plus there’s a review of the unique company, Photowall.com, who provided the printed canvas in this fun DIY. 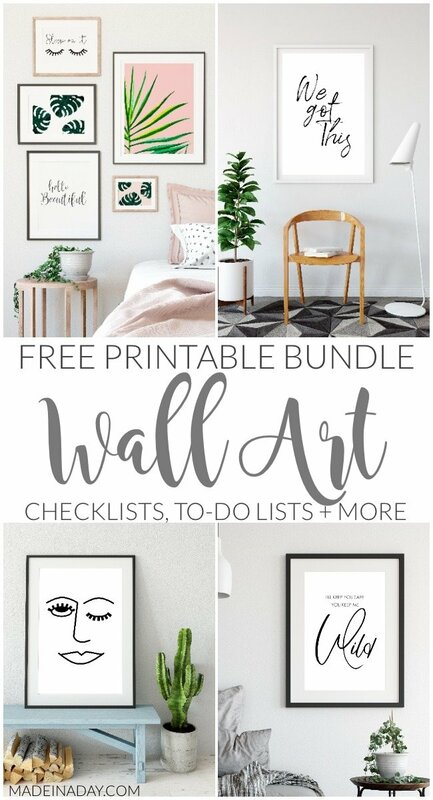 You can find more wall art ideas on my signs + wall art page. Last year I mounted a tapestry on foam for my family room. 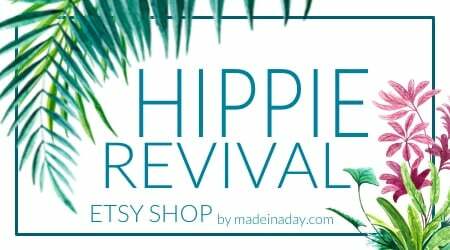 I was thinking it would look great in my guest bedroom which, like the rest of the house, also has a boho theme. I wasn’t sure what I could replace it with since it was such a large piece and I didn’t want to leave the family room looking bare. Then along came Photowall and my problem was solved! 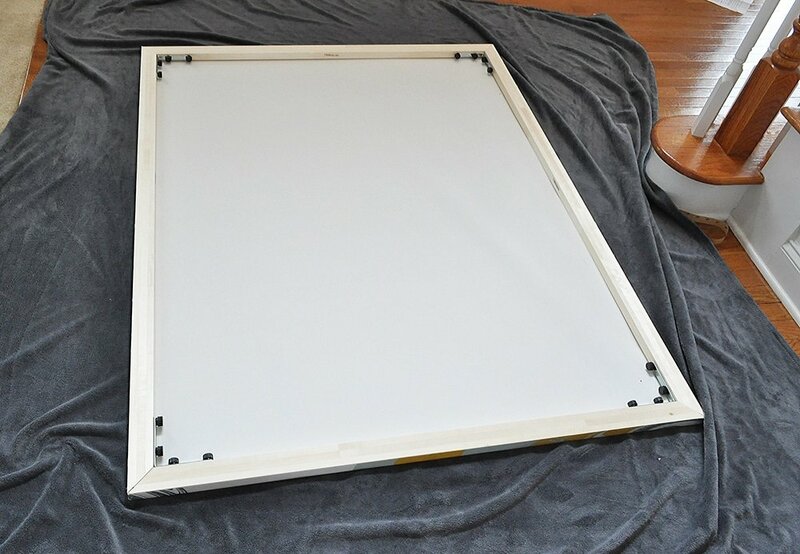 Today I am teaming up with Photowall.com to show you how to put together one of their fabulous printed canvases. It’s genius how these canvases are put together. Plus for my readers, there is an exclusive 20% discount on Photowall.com’s complete collection of Wallpaper, Murals, and Canvases. I had so much fun looking at the vast selection of patterns and prints to choose from. Let me just tell you, I wanted to go for the fun wallpaper and murals they make, but I may be moving and won’t be able to take it with me. I opted for a large abstract art canvas instead. 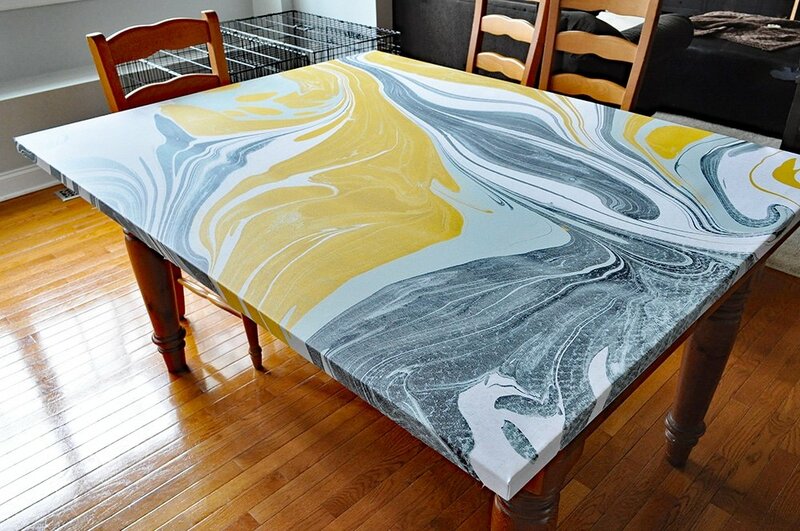 I chose the “Marbleing” canvas in yellow, green and white. Then I decided to crank it up a notch and add some gorgeous gold gilding to give the image a golden punch of color. 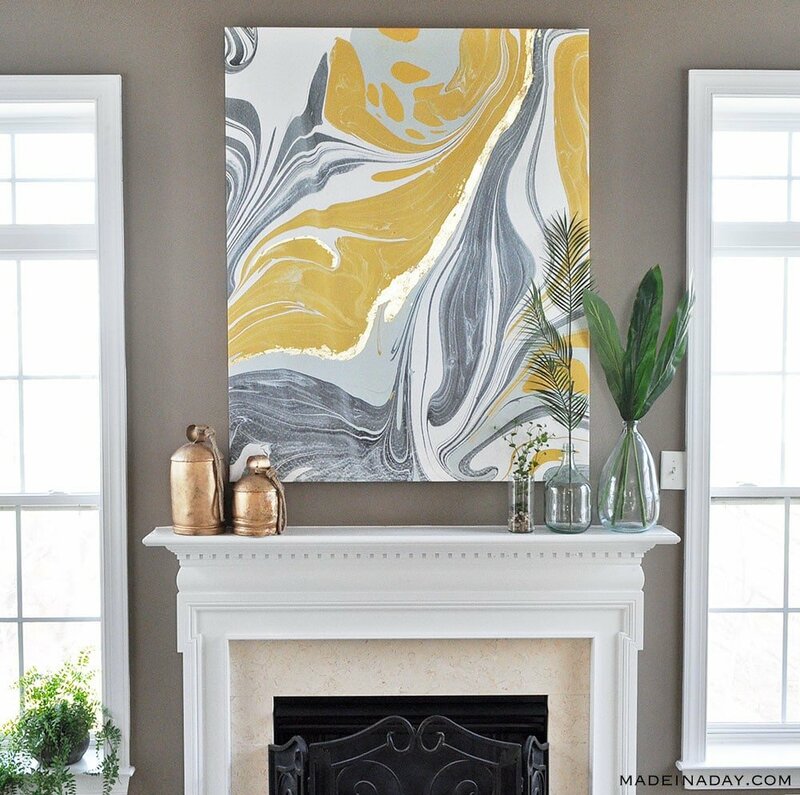 So now it’s a gilded marble canvas! First, let’s talk about Photowall’s canvas wall art. 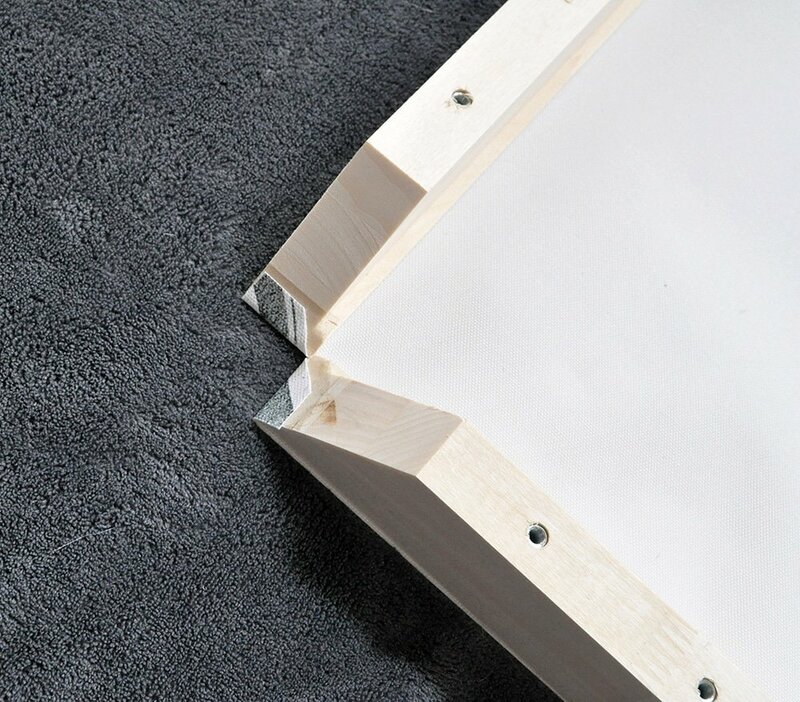 The canvases come rolled up and shipped in a box with a “do-it-yourself” frame kit. 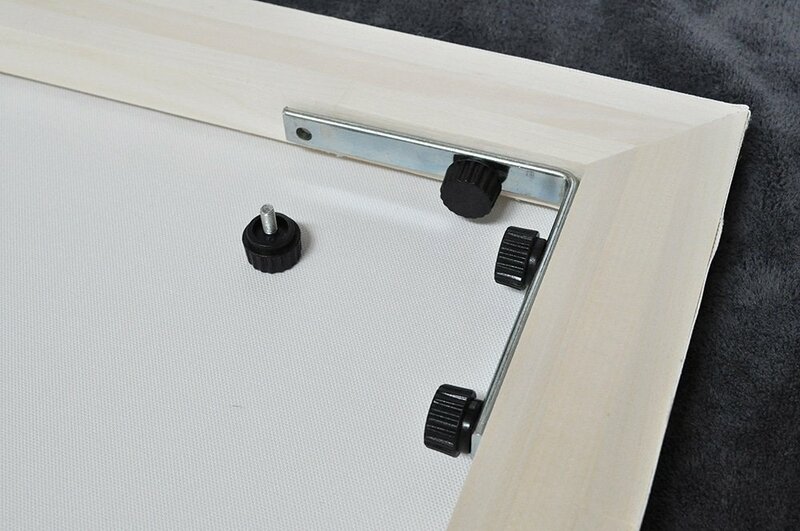 You then place the canvas printed side down and lay the wood frames down on the edges of the canvas. 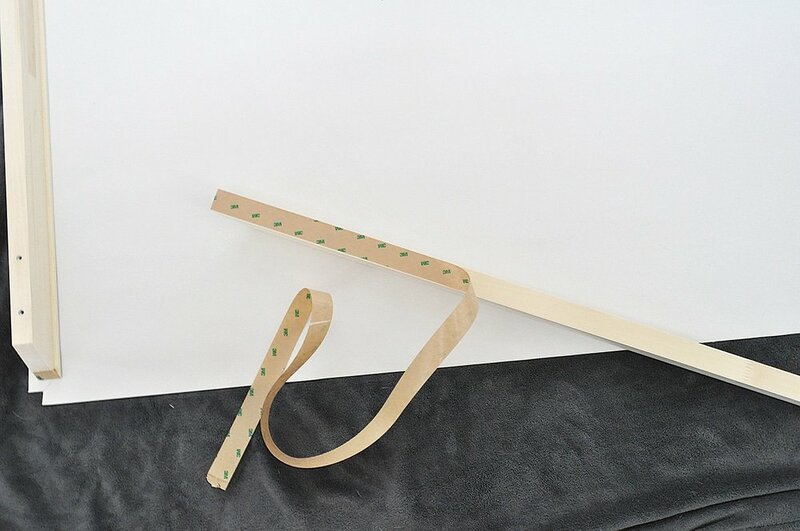 Line up the boards, pull off the adhesive strips an press them down on the edges of the canvas. 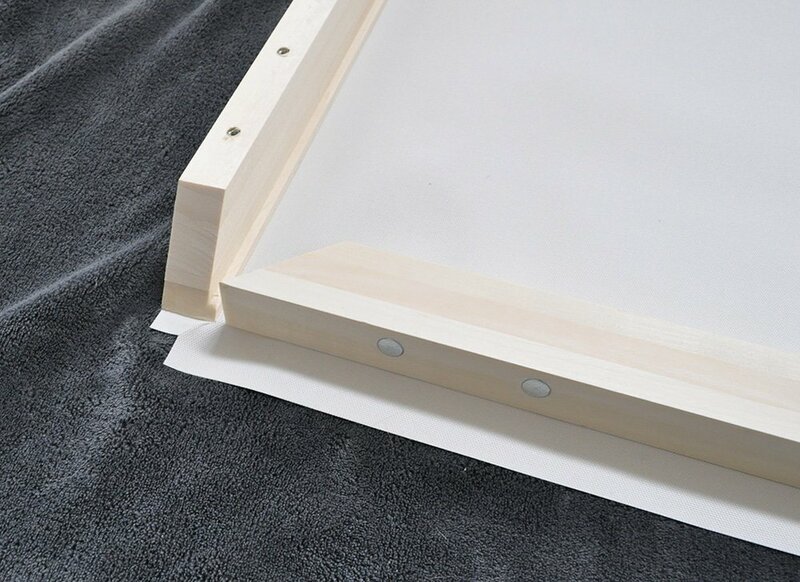 Fold the corners in and roll the frame boards inward to tighten the canvas. 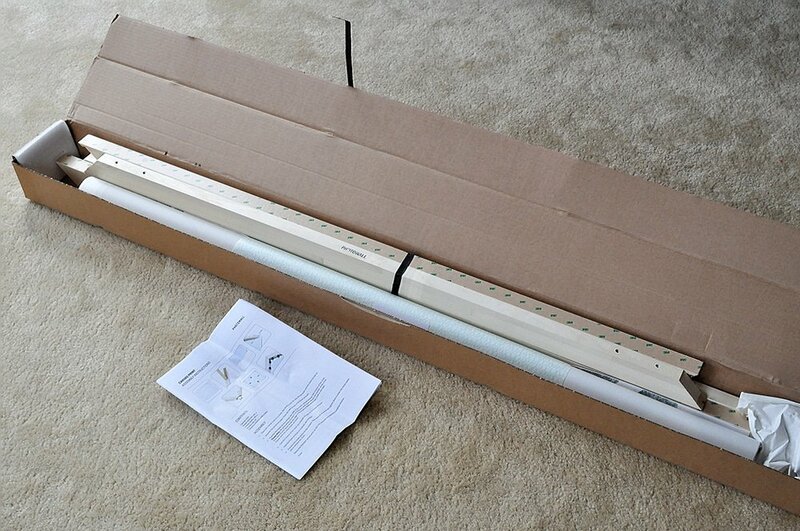 Add the brackets and screws to each corner, tighten the screws, then your canvas is ready to hang up! 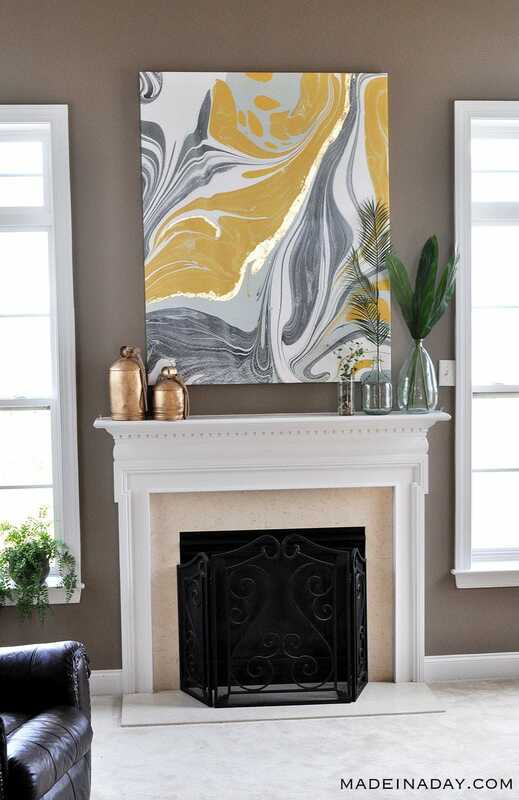 Lay the mounted canvas on a large table for enough space to be gilded. Make sure the sides of the canvas are supported. 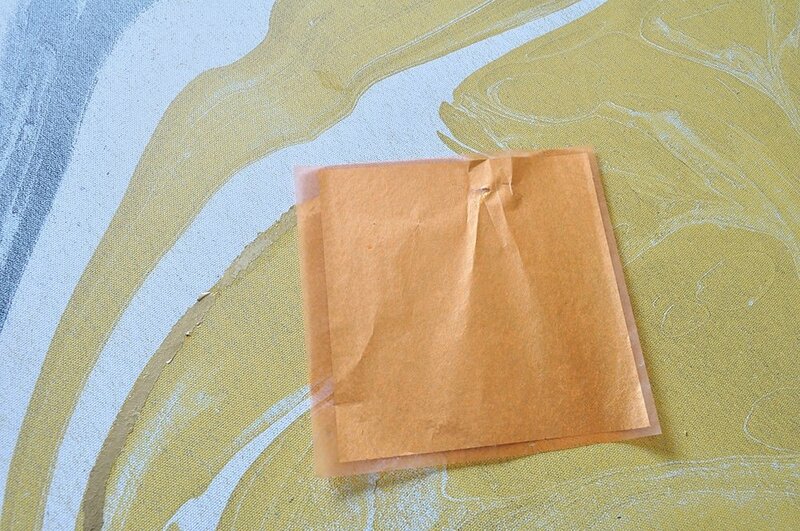 Lightly paint a thin layer of gilding adhesive on the canvas. NOTE: Do not press hard or add too much of adhesive to the canvas. You do not want to stretch the canvas or make it sag if it gets too wet. You can place a book or something similar to support the canvas from underneath if you like. Let the gilding adhesive dry for a few minutes until it is tacky. 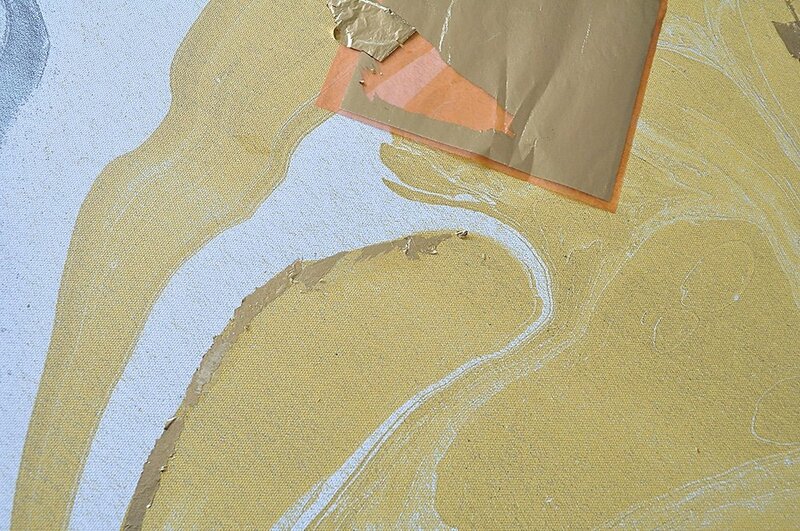 Lay the gilding sheet, gold side down over the adhesive and gently press down. Let it all dry and gently peel back the gilding sheet and repeat. 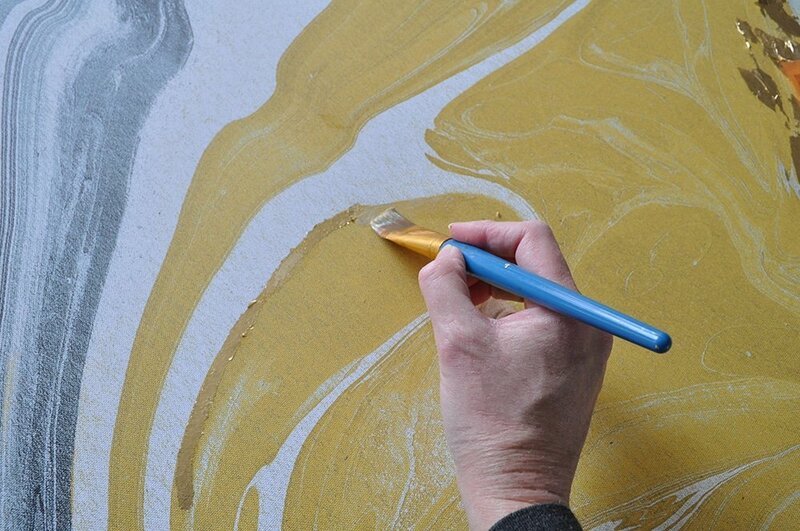 Use a dry stiff paintbrush and scrub off any loose gilding. 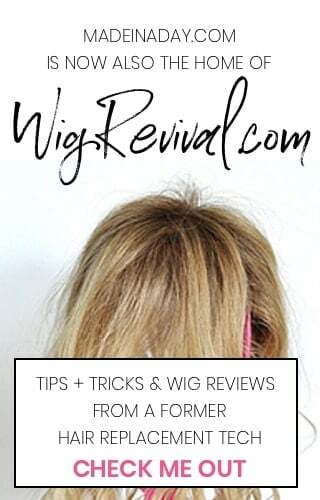 Touch up any spots as needed. Lightly paint on a very thin layer of sealant to keep the gold from tarnishing. 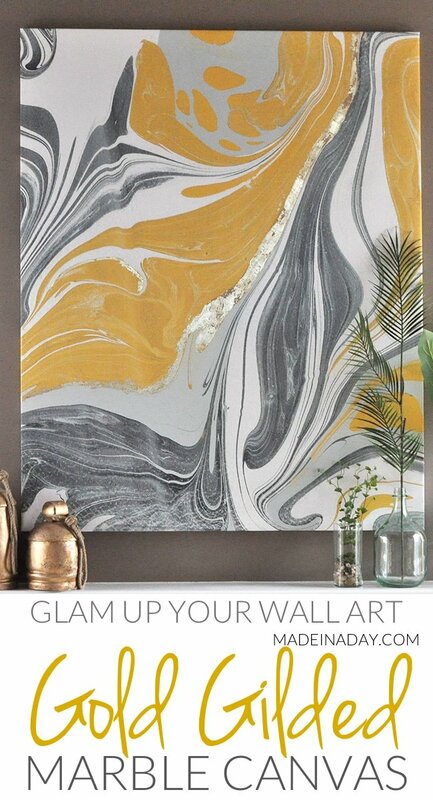 Let it dry and hang your new canvas! 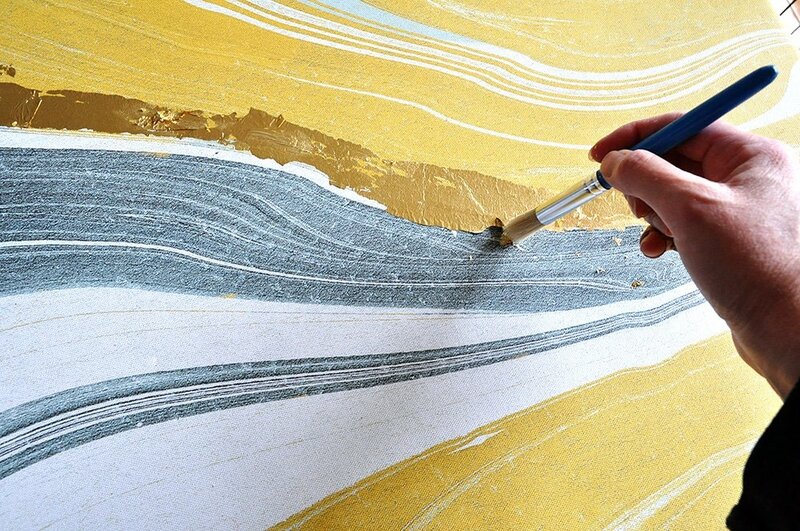 I really love the look of yellow and grey in this gilded marble canvas. It really lightened up the fireplace area of my home. Years ago we decided to paint our tall walls with a grey/brown color (Kingsport Grey/BM) and I so wish now we had left them lighter. This large canvas is 47 x 59 inches and uses up a lot of the dark space over my fireplace. Choosing these light colors really brightened and opened up this room! 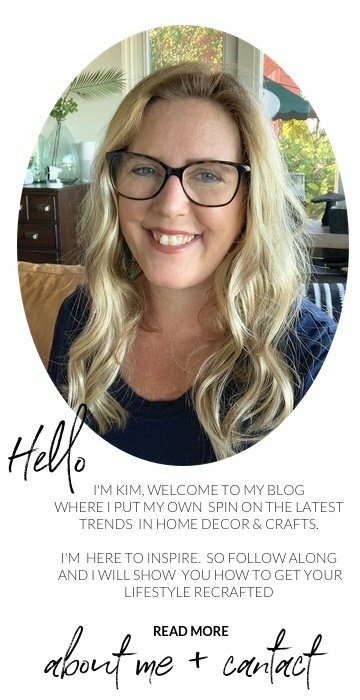 I love it and I hope you were inspired to make a fresh change in your home this year. 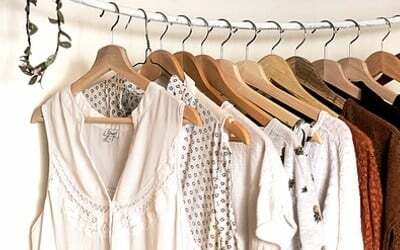 You will get 20% off the entire collection. Offer valid until the last day of April 2018. 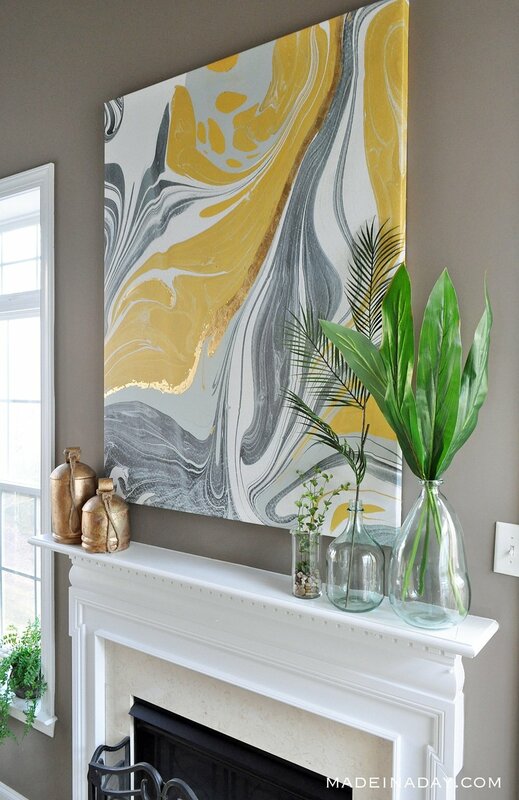 This is really beautiful, so perfect for bringing sunshine into a room. The gilding is just the right extra. Kim this is really classy! I would be proud to hang it in my home or office. I love it! This is such a great idea. I love how the gold sparkles against the yellow and grey. I am so in love with this! I have been wanting to try gilding for so long. Thanks for the inspiration! Thank you, Michelle! I have gilded so many things. It is so addicting. You should try it.